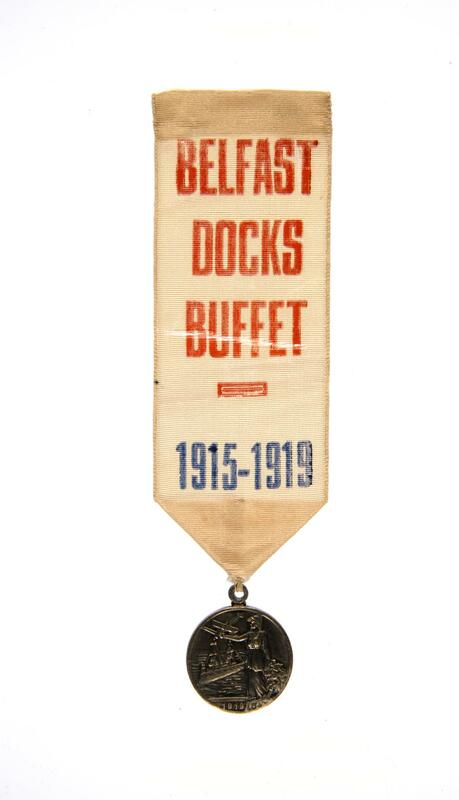 White ribbon badge with inscription in red 'Belfast Docks Buffet', in blue '1915-1919' sewn on to medal eye. REVERSE: Victory to right, holding sword in raised right arm, aeroplane above arm, Dreadnought on sea under, date 1919 in Exergue. OBVERSE: wreath, dated 1914 top left, 1919 bottom right on scroll in middle 'In commemoration for the Great War', at bottom R. D. 667093.